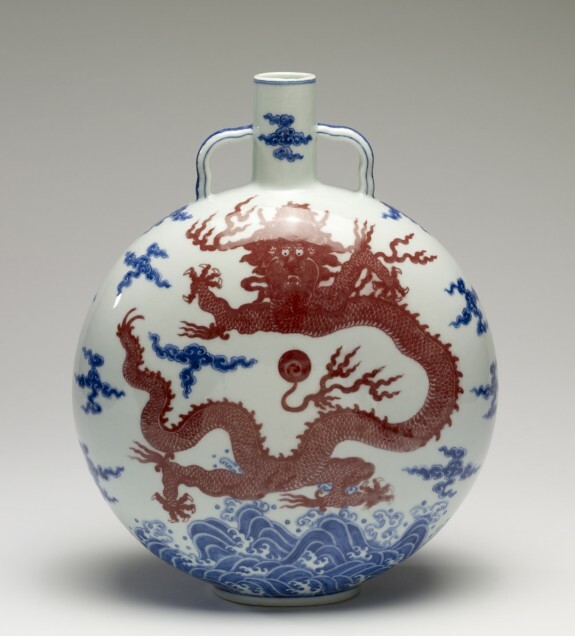 Description This moonflask of white porcelain is painted with underglaze blue and red designs. A five-clawed red dragon is depicted on either side, facing forward with its body coiled to protect a flaming pearl at the center. Flames issue from the scaly serpentine body of the dragon. In blue are painted the foaming crested waves along the bottom and scrolling clouds scattered across the sky. The flask is round in form, thus giving it the name full moon flask. Two thin handles are attached at the shoulders and rise to meet the straight narrow neck. The careful control of the cobalt (blue) and iron (red) pigments mark this vase as something rare and special. It was made at the imperial kilns in the city of Jingdezhen for the court in Beijing where it would have served as decoration for one of the many palace rooms in the Forbidden City. The Qianlong emperor who reigned from 1736 to 1796 was a great patron of the arts, commissioning and supporting production of vast numbers of exquisite works of art. This piece is marked as having been made during his reign and it is undoubtedly among the finest porcelains to emerge from the Chinese kilns. Imperial Chinese Treasures from the Walters Collection. 0. Masterpieces of Chinese Porcelain. The Walters Art Gallery, Baltimore. 1980-1981. Provenance William T. or Henry Walters Collection, Baltimore, prior to 1899 [mode of acquisition unknown]; by bequest to Walters Art Museum, 1931.